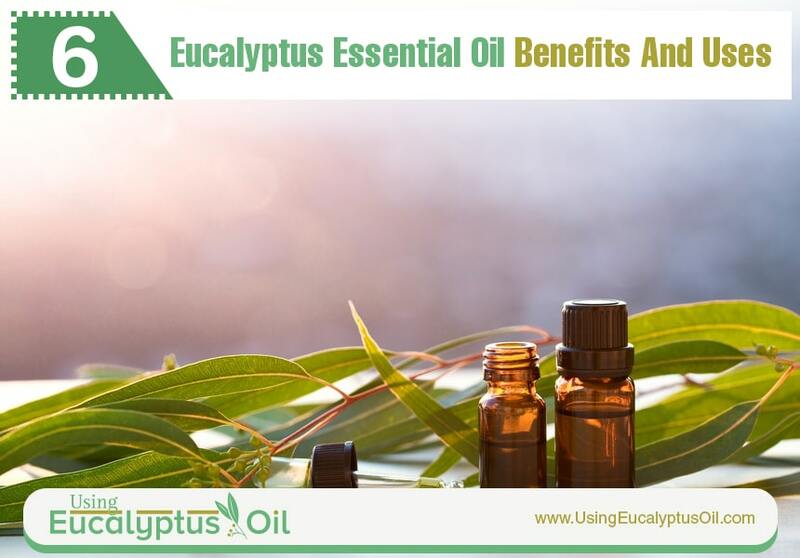 There are a wide variety of uses for eucalyptus essential oil. You can find it as an ingredient in many of the over-the-counter products you purchase at your local pharmacy. If you check chest rubs, cold medicines, throat sprays, inhalers, and other such products you'll found this essential oil in the ingredients list. The eucalyptus is a tree native to Australia, and the indigenous tribes have used it for healing purposes for centuries. The eucalyptus tree, or Eucalyptus Globulus, is an agricultural crop in places such as China, India, and some parts of Europe. These areas all grow eucalyptus for its healing properties, which come from the dried and crushed leaves. The way eucalyptus functions is as an expectorant. This means it combines with the toxins in your body and helps flush them out more quickly. 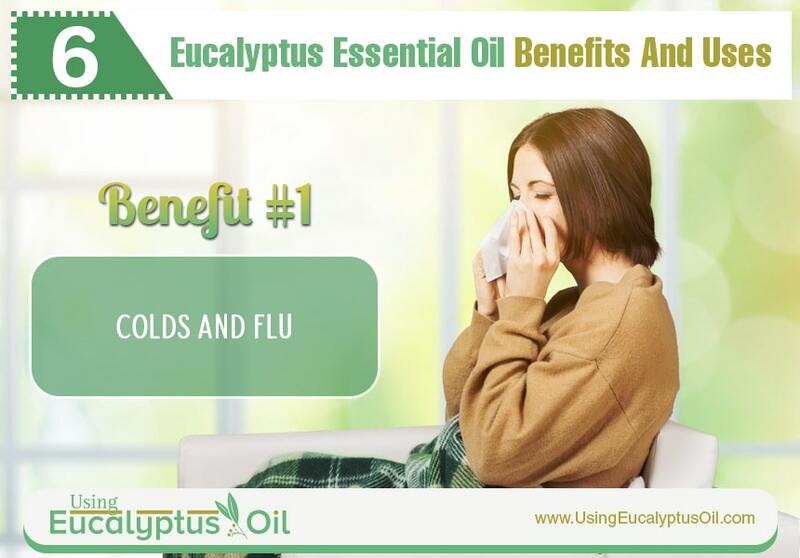 The most common way to use eucalyptus essential oil for colds is to place a few drops into your diffuser at bedtime. This will allow you to breathe in the mist throughout the night. For a particularly nasty cold, you may consider a steam bath. This isn't a full-body bath but rather done by pouring boiling water into a bowl about as large as your head. Mix in a bit of eucalyptus essential oil, around 10 or so drops. Drape a towel over your head to catch the steam, and just hold your face over the bowl and breathe in deeply. 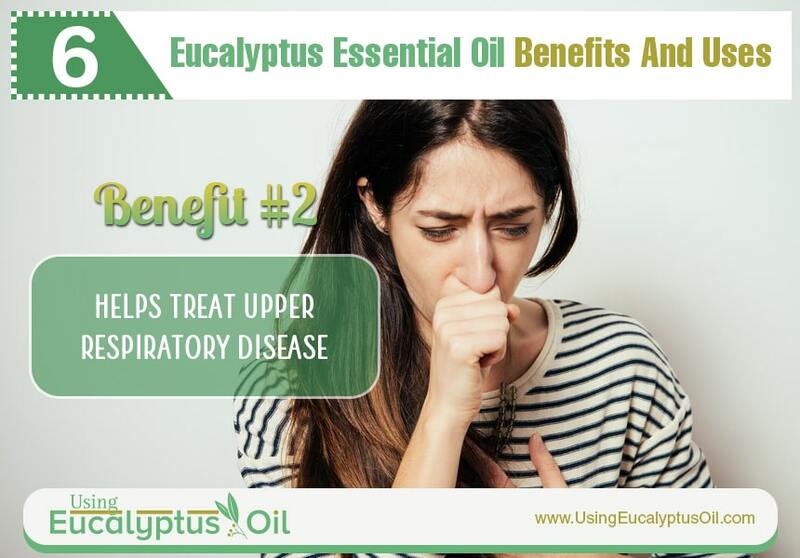 As is the case with many healing plants, eucalyptus essential oil has many antiseptic properties. This makes it exceptionally well suited for fighting off upper respiratory diseases. This gives you an all-natural option in your treatment plan. While it does possess these antiseptic properties via steam inhalation, there are better ways to use it for this purpose. Eucalyptus essential oil is best used in chest rubs, to create an inhalant or vapor that's thicker and more potent than steam. Make sure to apply liberally, to create as much smell as possible. No one likes dealing with stains. Everyone has had to throw something away because of a stain that could not be removed. Eucalyptus essential oil might be able to help avoid that fate. 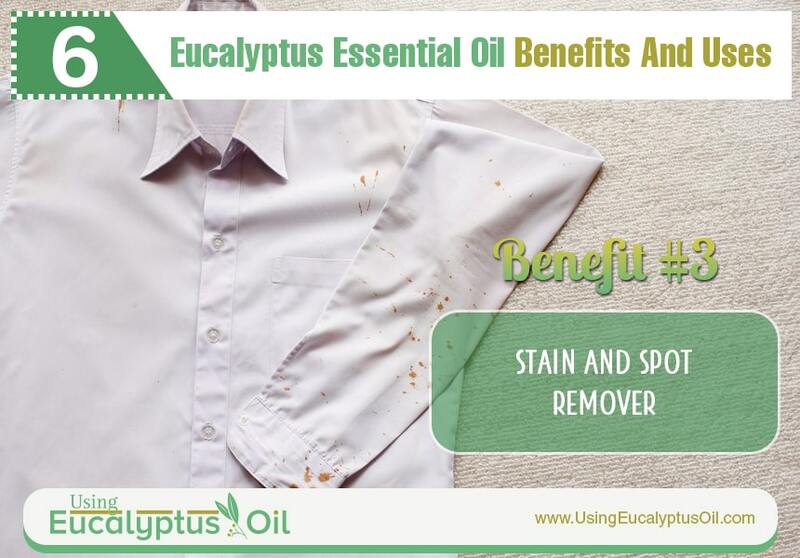 Eucalyptus essential oil is similar to lemon essential oil in how it removes spots and stains from fabric. It can even help to get gum off the bottom of shoes! Test it on an out-of-the-way spot first, though, just in case. You wouldn't want to cause a weird chemical reaction and make things worse! It doesn't take much to get a bellyache. Eating the wrong thing, or the right thing too fast, or moving the wrong way while eating, or doing one of a thousand other easy-to-do motions, and the next thing you know your tummy's upset. You can use this essential oil to help relieve those issues. Eucalyptus can work as a vermifuge, and so is often used in removing intestinal germs. 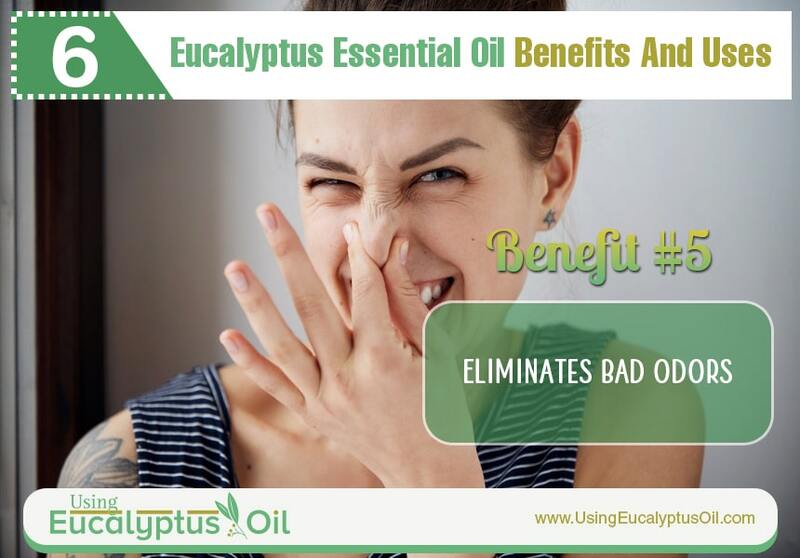 Study after study has indicated that digesting eucalyptus oil can help deter many of the intestinal conditions that arise from improperly balanced intestinal bacteria. It never hurts to have another way to fight off bad odors. 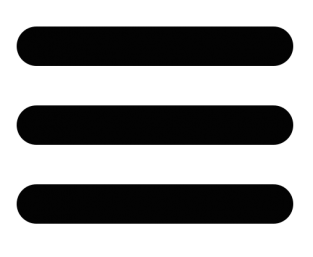 Many of the commercial sprays are made of harsh, toxic chemicals. But essential oils can offer a natural way to achieve the same effect. Whether it's a wet dog or yesterday's sweat socks, try applying oil-infused water made of eucalyptus oil as a topical wash. Allow the object to dry naturally, preferably in an outdoor area. The lack of harsh chemicals even helps the fabric keep its shape. For especially bad odors, try mixing lemon or tea tree oil. Upper respiratory conditions are incredibly painful. Many are lethal, and even the non-lethal ones cause constant coughing and difficulty breathing. You can help treat those problems with this essential oil. 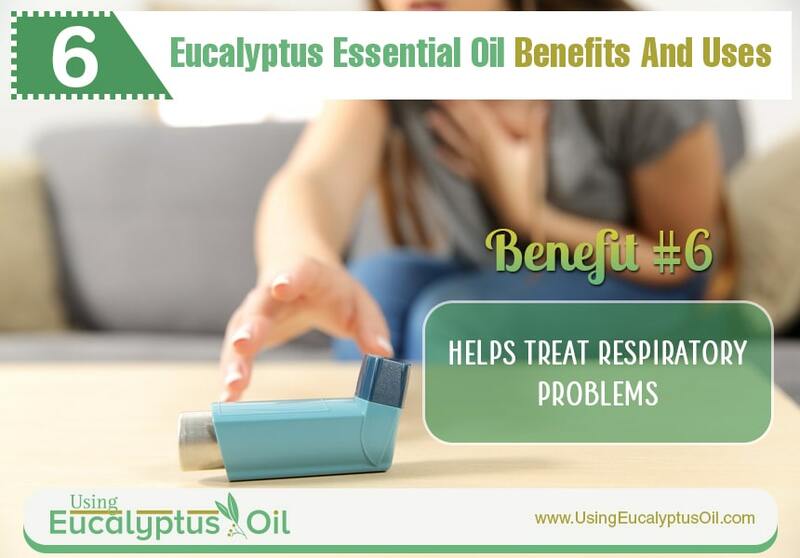 Since eucalyptus essential oil is so effective in treating these problems, many doctors suggest using it in a treatment plan for things such as bronchitis, asthma, and even tuberculosis. This is a proven treatment for asthma in specific since it helps to dilate the blood vessels and allow the lungs to receive more oxygen. Just mix up some eucalyptus, peppermint, and coconut oil, and rub liberally on your upper chest. Essential oils may be all-natural, but so is arsenic. Since all-natural doesn't mean "100% safe", be on the lookout for any signs of an allergic reaction. If you're pregnant or nursing, please consult a doctor before using any new treatments. You'll also want to ensure the bottle is 100% pure essential oil and is the right kind of oil when you buy it. As an example, you should find Eucalyptus (Eucalyptus Globulus) to indicate the exact type of oil. The word "fragrance" means there are additives, and so they're not pure oil. It's always best to find an organic source for essential oils, preferably the ones labeled "therapeutic grade" since those are the types with the highest purity. Also, try to avoid any other chemical additives. With a multi-faceted set of medicinal properties, Eucalyptus essential oil is a wonderful addition to any medicine cabinet. Here are 7 ways to try it.